Rugby football was played in the Connemara area as early as the 1920’s. Those employed in the Marconi Station played the game of rugby and took on Clifden in some friendly games. In the 1940’s, Colleges such as Blackrock and Castleknock as well as Clongowes had a fair representation of Connemara youth. St. Josephs College, Garbally Park, Ballinasloe also had a very strong Clifden/Connemara contingent of students. All of those colleges at that time provided a pool of eager but idle rugby players, itching for a game, especially throughout the school holidays. This in turn brought about the formation of a new rugby team called the “Connemara Blacks”, named after the famous fishing fly. Those credited with the idea of this team formation are James B. Joyce (known in rugby circles as “Dusty Foot”) and the Oughterard Brothers Jim Joyce and Dr. Paddy Joyce. They contacted players and arranged fixtures with Galway Corinthians and Westport. The inaugural fixture was against Corinthians, at Woods’ Field in Clifden on St. Stephen’s Day 1946 which resulted in a 6-6 draw. The Connemara Blacks had their first win when they defeated Westport by 11-8 on the 6th January 1947. Various members of the original Connemara Blacks went on to represent their Province, and play for some top clubs in the country and in England, especially London Irish. With the introduction of the free education scheme in September 1967, the Franciscan Brother’s Secondary School had over 150 boys from all of North West Connemara. In November of that year a vote was taken by the student body to decide what game they would play competitively and a majority voted for Rugby. The School was affiliated to the Connacht Branch of the I.R.F.U. on 11th January 1968 as the Franciscan College Rugby Football Club, Clifden. 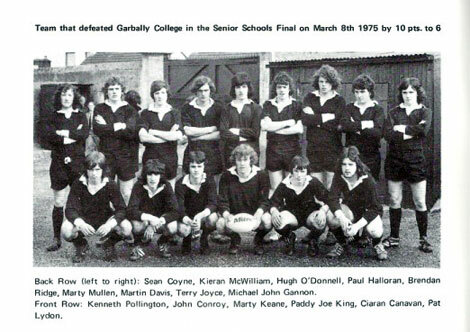 In a short time the school established itself as one of the strongest in Connacht and in December 1972 rugby history was made at the Sportsground in Galway when the Connacht Juvenile League was brought in triumph to the Capital of Connemara. 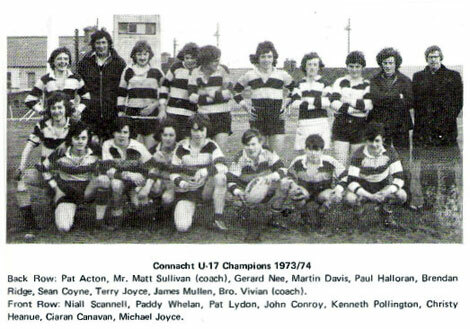 The same team won the Juvenile Cup later in the season and the Under 17 team also won the Connacht Cup. In March 1975 the School won the Senior School’s Cup for the first time, the following year they won the School’s Cup and the following year they won the School’s Junior Cup. With all this talent available it was inevitable that a Junior team would start in the area. On Thursday February 1st, 1973 the new Connemara Blacks were born at an inaugural meeting in Clifden House Hotel, with Br. Killian in the chair. Committee: P. Joyce, Recess, M.J. Ruddy, G. Smith, Br. Killian. The team played its first game on Sunday 11th March 1973 in Wood’s Field against Corinthians in a preliminary round of the “Ard na Cregg Cup”. The following were the players on that team: A. Joyce, M. Sullivan, J. Flanagan (Capt. ), M.J. Ruddy, M. Greany, M. Cummins, M.J. Ferrons, S. Coyne, Josie Joyce, T. McWilliam, J. Crean, B. Coyne, S. Walsh, N. O’Toole, S. O’Toole. From that opening game the Club has participated fully in all Branch Competitions. In April 1975 the Connemara Blacks reached the Junior Cup final against Westport in which they were unlucky to lose by 4 pts – 3 pts. In March 1980 the Club played in the Senior Cup for the first time against Ballina. In June 1976 the club purchased a playing pitch from the Franciscan Brother’s which had to be developed into a proper playing area. So, what the young men in the early 40’s set out to do, and for many years was a mere but very fond memory for them, is now an accomplished fact.